Live! 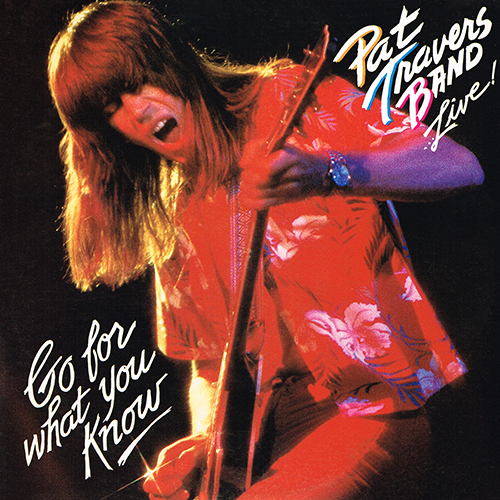 Go For What You Know is a live album by the Pat Travers Band, released in 1979 on Polydor Records. It reached platinum status in the US, and was re-released on CD in 1993. While most bluesy hard rock acts of the '70s and '80s hailed from the United States (the South, to be exact), there were several exceptions to the rule, such as Canadian singer/guitarist Pat Travers. Born in Toronto on April 12, 1954, Travers first picked up the guitar just prior to entering his teens after witnessing a local performance by the great Jimi Hendrix. It wasn't long before Travers was studying the other top rock guitarists of the day (Eric Clapton, Jeff Beck, Jimmy Page, etc. ), and paying his dues by playing in bar bands in Quebec. His first true touring gig came his way when he hooked up with '50s rock & roll vet Ronnie Hawkins (best known for performing with a backing cast that would eventually transform into the Band). But Travers' main love was hard rock, so after a year, he packed up his belongings and headed to London. Shortly after touchdown in the U.K., Travers recorded a demo that would land him a recording deal with Polydor and result in the release of his debut, Pat Travers, during the spring of 1976. A performance at England's annual Reading Festival the same year only piqued further interest, which resulted in two more releases in 1977, Makin' Magic and Putting It Straight (both of which followed a pre-Iron Maiden Nicko McBrain on drums), before Travers returned to North America and set his sights on the U.S. rock market. 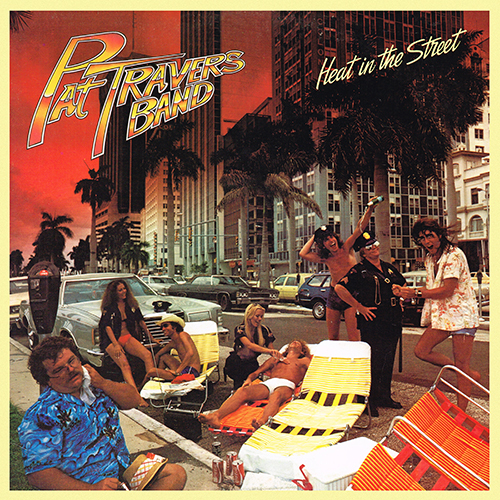 Featuring drummer Tommy Aldridge, guitarist Pat Thrall, and bassist Mars Cowling, the new Travers band lineup premiered on 1979's Heat in the Street. This led to Travers' most commercially successful period, resulting in a pair of Top 30 releases, 1979's Live! Go for What You Know (considered by many Travers fans to be his finest hour) and 1980's Crash and Burn. But soon after the dawn of the '80s, bluesy hard rock seemed to quickly fall out of favor among the U.S. record buying public, in favor of slickly produced arena rock, and later, MTV-approved bands. As a result, each subsequent Travers release sold less, as his last albums to appear on the U.S. album charts included 1981's Radio Active, 1982's Black Pearl, and 1984's Hot Shot. Unhappy with Polydor, Travers opted to take a break from releasing albums for the remainder of the decade, but continued to tour. Travers' 1990 comeback album, School of Hard Knocks, failed to re-spark interest on the charts, although he continued to issue new studio albums (Blues Tracks, Just a Touch, Blues Magnet, etc.) and archival live sets (King Biscuit Flower Hour, BBC Radio One Live in Concert) throughout the decade. Travers continues to tour and record regularly (playing alongside the likes of Night Ranger's Jeff Watson, Cinderella's Tom Keifer, and Rick Derringer), and in 2001, performed as part of the Voices of Classic Rock tour. Travers emerged from the recording studio once more in 2003, with P.T. Power Trio, a recording that featured covers of songs by the likes of Cream (''White Room''), Robin Trower (''Day of the Eagle''), and ZZ Top (''Nasty Dogs and Funky Kings''), among others. Subsequent releases include 2004's It Takes A Lot of Balls, a collaboration with Carmine Appice, PT=MC2 (2005), a second Power Trio outing called P.T. Power Trio 2 (2006), Travelin' Blues (2009), Blues on Fire (2012), Can Do (2013), and Retro Rocket (2015). In 2016, Travers reunited with Appice for the cheekily titled Balls Album, which saw the dynamic duo tearing through a set of classic blues-rock numbers. © Copyright 2011-2019 - SONIC-RECREATION.COM is a division of H8 Enterprises. Designed by John Haight. All Rights Reserved.